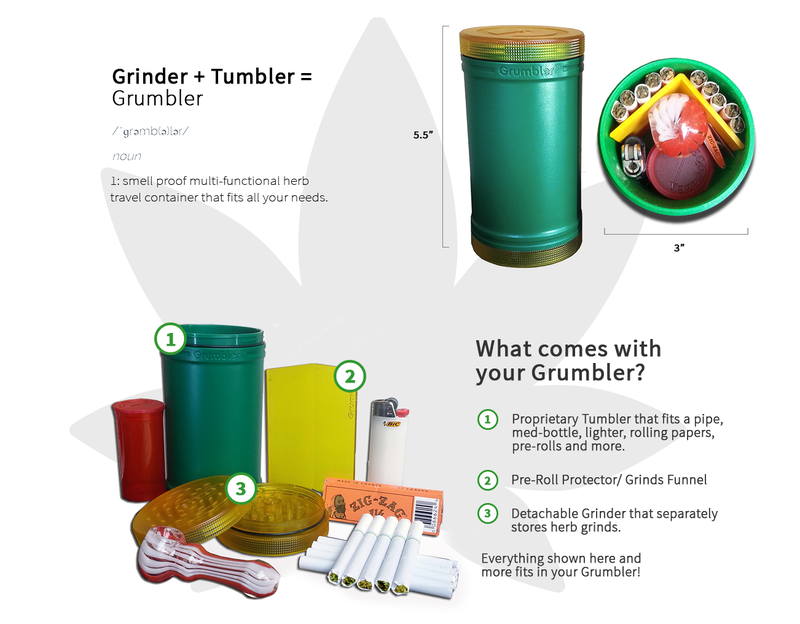 Fit all your needs in the Grumbler. Order Your Grumbler on Amazon Today! Ingeniously designed to be simple, compact, and versatile. Comes with detachable grinder and pre-roll protector/funnel. Organize your herb and accessories in a smell proof, impact and water resistant hard case. Child resistant seal protects against tampering from children up to ages 7. Made in the USA from superior materials to provide a quality experience all the time, every time. No more fumbling with Ziploc bags and Tupperware. Organize and protect your herb accessories and pre-rolls with ease. The Grumbler offers you a simple storage solution in style. It also makes the perfect gift! Medicating with herb is dynamic. It is a social activity that can be enjoyed with company or a personal, spiritual experience that can enhance the moment. The Grumbler is designed to make those moments and the trips that get you to those moments as convenient and stress free as possible.